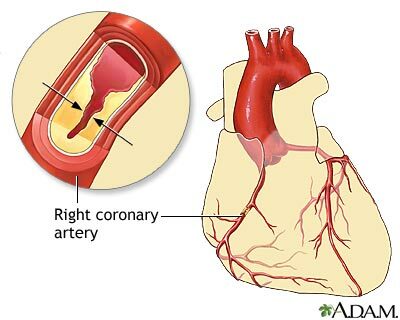 The coronary arteries supply blood to the heart muscle itself. Blood supply through these arteries is critical for the heart. Coronary artery disease usually results from the build-up of fatty material and plaque, a condition called atherosclerosis. As the coronary arteries narrow, the flow of blood to the heart can slow or stop, causing chest pain (stable angina), shortness of breath, heart attack, or other symptoms.